From beading to embroidery, dimensional quilts and colouring fabric, there are classes and projects for beginner to advanced quilters. 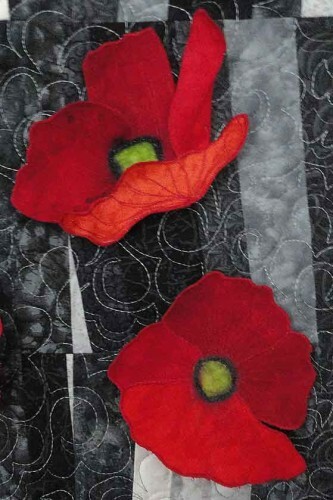 Fabulous Flowers offer a chance to add some beading and beginner thread play as well as alternative border/binding treatments. Sensational Sunflowers introduces dimensional flowers and Poppin’ Poppies utilizes water soluble stabilizer and a hoop to make vibrant 3D poppies. There are also classes for water colour fabric painting to make beautiful sky and water fabrics as well as projects such as SummerTime Ferns introducing Paintstiks. Both of these projects introduce the use of dimensional flowers. Students learn how to make a 3D Sunflower as well as practicing other applique techniques. The “technique” workshop takes a full day, the “project” class (where students make the bag or wall hanging) would need one extra full day. 3D Flowers on a wool background-neat! This pattern/class focuses on two great techniques. 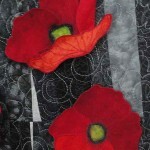 Playing with fabric and thread, using water soluble stabilizer and embroidery hoops to create 3D flowers requires a full day, with either a presentation of the strata technique at the end of the day or as a second full day class. Choose SummerTime Ferns or a technique oriented workshop to introduce the use of these fun, oil-based paints. Using water-based Seta paint, students create pieces of fabric to use in projects. Love all the beautiful quilts you posted from your birch tree class. Lovely pieces by the ladies! 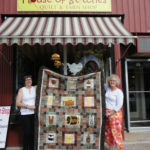 Really enjoyed your blog on the “hook, line, and sinker” quilt as well. You have a gorgeous website that shows your beautiful designs off so well. Keep up the inspiring work! Thanks Karen, always love to share-makes quilting FUN!